Above is a quote from John D Rockefeller. John was an American industrialist and philanthropist. He started the Standard Oil Company, the University of Chicago and the Rockefeller Foundation. Born July 8, 1839 in Richford, New York. John Davison Rockefeller at age 19 started his first company, Clark and Rockefeller in Cleveland, Ohio. The company grossed $450,000 in the first year. John bought out his partner Clark a few years later and expanded the business into oil. John Rockefeller formed the Standard Oil Company in 1870 with his brothers. By 1879 90% of American oil was refined by Standard Oil Company. John Rockefeller believed in giving 10% of his income to church and charity. The University of Chicago opened in 1892 as a result of John’s respect for the Baptist Church. In addition, Rockefeller University in New York City was charted in 1901 for medical research. The Rockefeller Foundation was formed in 1913 "to promote the well-being of mankind throughout the world." Mr. Rockefeller spent a lot of his time outside of business with his wife Laura and four children. After 97 years John D Rockefeller died on May 23, 1937. His life is vividly captured in Titan the first full-length biography based on unrestricted access to Rockefeller's exceptionally rich trove of papers. A landmark publication full of startling revelations, the book will indelibly alter our image of this most enigmatic capitalist. 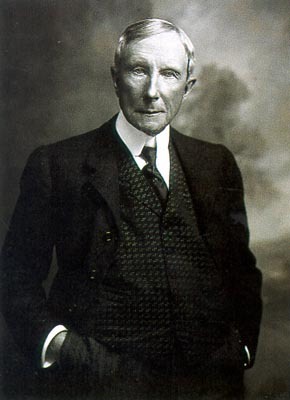 John D Rockefeller was likely the most controversial businessman in our nation's history. Critics charged that his empire was built on unscrupulous tactics: grand-scale collusion with the railroads, predatory pricing, industrial espionage, and wholesale bribery of political officials. The titan spent more than thirty years dodging investigations until Teddy Roosevelt and his trustbusters embarked on a marathon crusade to bring Standard Oil to bay. While providing abundant new evidence of Rockefeller's misdeeds, the author discards the stereotype of the cold-blooded monster to sketch an unforgettably human portrait of a quirky, eccentric original. A devout Baptist and temperance advocate, Rockefeller gave money more generously. Titan presents a finely nuanced portrait of a fascinating, complex man, synthesizing his public and private lives and disclosing numerous family scandals, tragedies, and misfortunes that have never before come to light. John D. Rockefeller's story captures a pivotal moment in American history, documenting the dramatic post-Civil War shift from small business to the rise of giant corporations that irrevocably transformed the nation.